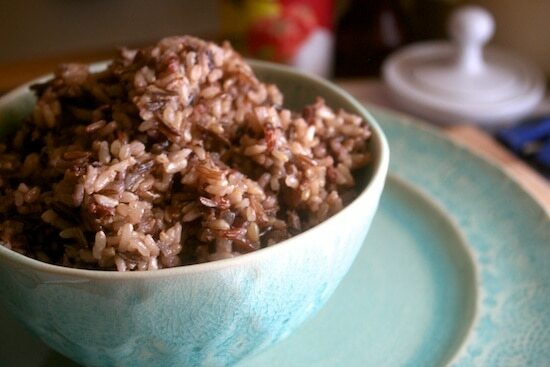 Meet my favorite blend of wild rice! You can, without a doubt, find this baby at the bulk section of your nearest Whole Foods. 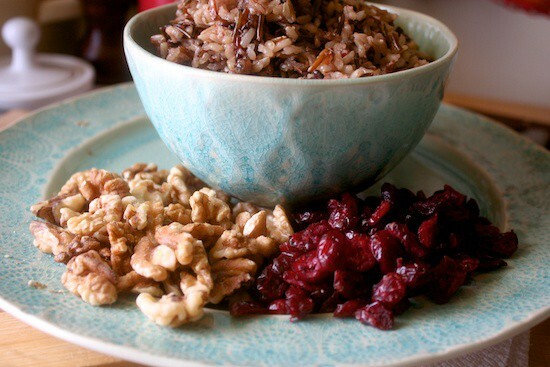 What is a wild rice blend, and how does it taste? It’s just a nice, big combination of rices. Nothing too fancy. You get the thickness and the heft of wild rice without the hefty price tag, and you also get a nice twist on your regular brown rice. A good blend will contain anything from regular brown rice to red rices to even short black sticky rice, either in short or long grain varieties. How do I store my wild rice blend after buying it? 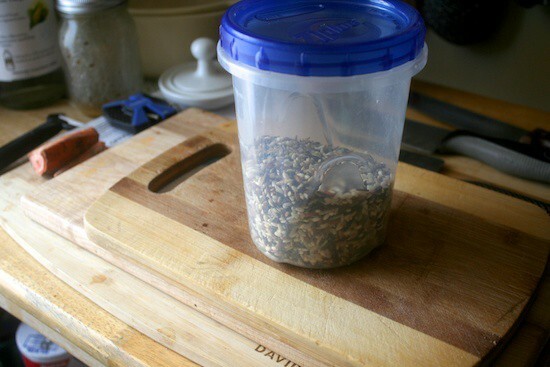 You always, without a doubt, want to store your grains in a seal-top container. You don’t want to have the rude awakening of pulling out a cup of rice with little critters growing in it. Trust me. I learned this the hard way. How do I choose a quality wild rice blend? Look for blends that don’t contain “polished,” “pearled,” “bleached,” “hulled,” or “husked” rices. You don’t want anything white in there. They’re often used as filler, and affect whether or not you’re getting your money’s worth. 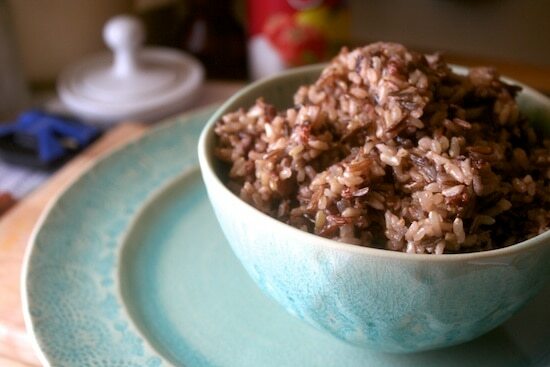 How do I cook my wild rice blend? Keep it simple. 2 cups of water for every 1 cup of rice you plan to cook. Bring your water to a rolling boil, dump your rice in, stir it one time – and no, you don’t want to rinse this before you cook it – and leave it alone. Cover it, boil it for 45-50 minutes. You’ll know its done once your wild rice grains have started splitting and showing their fluffy insides. The average cup of uncooked rice yields about 3 cups of cooked rice. …but what if you’re an adventurous type, like me, and you don’t want to keep it simple? A cup of walnuts, a half-cup of cranberries, and a blend of a quarter-teaspoon of nutmeg with a tablespoon of butter for every 3 cups of cooked rice, and a healthy pinch of salt. What do you like to put in your wild rice blends? Gimme some ideas! I’m confused I’m a newbie to the site (which is great btw) I am purchasing one of the meal plans and I have been printing articles all morning here, my question (which I am totally willing to donate $25 to the site for) am I counting calories with this new clean eating plan? Is there a book of all the listed recipes I can purchase with a chart that way I can carry everything with me in my purse? Hell I’m so lost at this point you can charge me to answer my questions just to get caught up. You *can*, but you don’t have to do that just yet. More often than not, people find that the natural limitations that clean eating provides – namely, fat and fiber – helps them gauge their satiety in ways that render calorie restriction unnecessary, so they don’t bother. It all really depends on how much you have to lose to get towards your goal. If it’s just 10 or so lbs, then you may want to count; if not, it might not be that big of a deal. I like to sauté raisins and 1/2 a plantain in one pat of butter. Then I put it on top of my brown rice / wild rice blend. Also, tread lightly; I’m pretty sure that no woman is interested in why you, as a man, think “black women” are fat. Especially not here. I make it risotto style. Saute onions in olive oil, when they are tender, add shredded spinach, cook it a bit then throw in the wild rice mixing it a bit. Add the water, bring to a boil, lower heat and cover. You can add a bit of water at the end if it is still not done. Also like to do it this way with mushrooms, or add a can of black beans near the end. 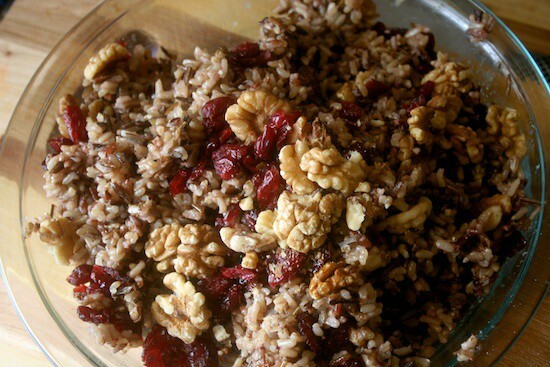 I usually use 1/2 cup wild rice blended with 1 cup of brown rice and 3 cups water.